Antique - Sutherland Fine Bone China Tea Set, we believe to be Pattern SUT66, produced in the early 1900's. Total of (33) Pieces. From the Edwardian, or Art Nouveau Period. 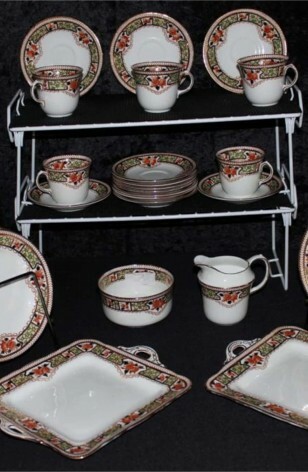 This China Set is a beautiful, and highly decorated, Hand Painted Set. The Well of the Plates is Bright White, but the Lip has Deep Orange Roses with Cobalt Blue Leaves, Light Green Polka Dots on a Cobalt Web, Inner and Outer 22kt Gold Verge, White Chevron on Outer Edge of Lip, and 22kt Gold Rim. A very Dramatic Pattern. One of the most beautiful of the Sutherland Patterns. Antique - Sutherland Fine Bone China Tea Set, we believe to be Pattern SUT66, produced in the early 1900's. A Set of (33) Pieces. From the Edwardian, or Art Nouveau Period. 12 - Luncheon Plates - 7 1/2"